← Happy Halloween from Richmond! The ride from Richmond to Petersburg was our shortest yet – less than 30 miles – so we slept until 9 or 10am and had a leisurely morning. After Dennis returned from an exam he had at school and Crystal returned from cleaning a house, we walked to Joe’s, a neighborhood bar/restaurant, for breakfast. We ate and then walked back to Dennis’s dad’s house to pack up, and we were back on the road just past 1pm. It was a sunny day, and warm enough for shorts and no jacket. The first half of the ride went by very quickly, and we stopped to break at the Food Lion (a great name for a supermarket, in my opinion) less than an hour after we had begun. We took route 301 the whole way, so it was a fast, straight shot to Petersburg. Arriving at Henry’s house just before 4pm, we had spent less than two hours on our bikes that day. Henry welcomed us inside and helped carry our bags and bikes up to his 3rd floor condo. 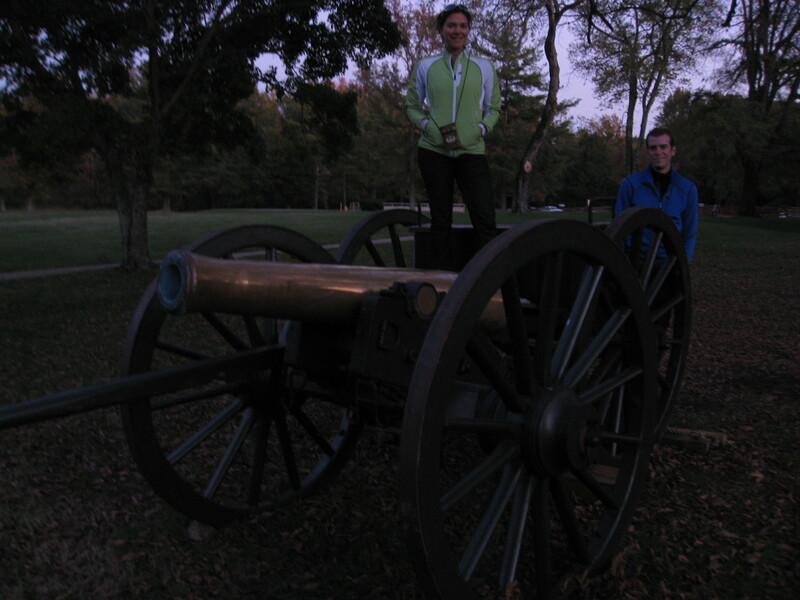 He brought us to the Petersburg battlefield, where we walked around and checked out the trenches, cannons, and other battle equipment that was still there. We also saw at least ten deer during our hike. Henry had driven us onto the army base to get to the battlefield, and we had hiked through some woods. It was dark on our hike back to his Jeep, and we found that we had taken the wrong path when we emerged from the woods on the outside of the base. Phil and I waited outside the gates while Henry ran back in to get the car, since I had left my ID in the car. When we got back to his house, Henry phoned his friend, Steve, and we all went out for sushi in the old downtown part of Petersburg. We stayed up talking (mostly about traveling) back at Henry’s house for a few hours before going to sleep. Posted on 2 November 2011, in Bicycle Touring, Providence to New Orleans. Bookmark the permalink. Leave a comment.